Perfect for a special occasion, this beautiful property is ideally located close to the Devon and Somerset border and can accommodate up to 42 guests. . Ground Floor: Living room 1/dining room: With wood burner, Sky TV (movies package), DVD player, dining table (seats 42) and French doors leading to garden. Living room 2: With wood burner, Sky TV (movies package), DVD player and beams. Living room 3: With Freeview TV and beams. Living room 4: With Freeview TV and beams. Kitchen 1: With Rayburn, 2 electric cookers, microwave, fridge, fridge/freezer, 2 dishwashers and tiled floor. Kitchen 2: With dining area, electric cooker, electric hob, microwave, fridge, fridge/freezer, dishwasher and tiled floor. Kitchen 3: With electric cooker, microwave, fridge, fridge/freezer and tiled floor. Kitchen 4: With dining area, electric cooker, microwave, fridge and dishwasher. 5 separate staircases to first floor. First staircase to... First Floor: Bedroom 2: With double bed, 3 single beds and en-suite with shower over bath, and toilet. Bedroom 3: With double bed, twin beds and en-suite with shower cubicle and toilet. Bedroom 4: With double bed, 3 single beds and en-suite with shower cubicle and toilet. Second staircase to... First Floor: Bedroom 6: With double bed, single bed and en-suite with shower cubicle and toilet. Bedroom 9: With twin beds. Third staircase to... First Floor: Bedroom 10: With double bed. Bedroom 11: With twin beds. Bedroom 12: With twin beds. Fourth staircase to... First Floor: Bedroom 13: With double bed and en-suite with shower over bath, and toilet. Bedroom 14: With double bed and en-suite with shower cubicle and toilet. Fifth staircase to... First Floor: Bedroom 15: With double bed and en-suite with shower over bath, and toilet. Shared use of 30-acres of unspoilt garden. Set in the Exe Valley and very accessible from major roads, are these four beautiful properties which all offer the perfect holiday retreat. 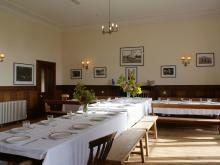 All or part of the complex can be booked for large groups, parties or family gatherings. It would make an ideal venue for a wedding, with facilities allowing up to 130 guests to attend, by arrangement.